Sheeza is the Founder and CEO of UpEffect, a crowdfunding and support platform launching products doing good in the world. Sheeza combines her Computer Science background with her passion for social entrepreneurship to work with revolutionary founders to tackle humanity’s greatest challenges. She has helped companies raise over £100,000 to positively impact lives in 6 countries. Her work has been featured in The Guardian, Huffington Post, The Telegraph and Virgin. She is often found championing conscious capitalism and social entrepreneurship at universities, business leadership events and various other platforms. 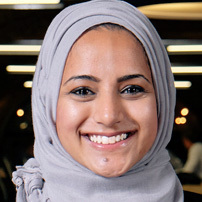 Sheeza was named to DotEveryone’s ’12 top female tech founders’ by Baroness Martha Lane Fox, was awarded “Lady of the Year” by Opportunities for Youth and won Silver at MassChallenge UK for her award-winning crowdfunding platform. She received an MSc from The University of Nottingham in Computer Science and Entrepreneurship and currently lives in London.